The door’s skin is made from impact-resistant fibreglass (thermoset GRP – glass reinforced polyester) and is compression moulded to offer detailed panel definition and lifelike wood grain effect which will not expand, contract, bow, warp or twist. The stiles and rails are composed of water resistant polymer which are bonded to the skin and filled with an insulating core of 100% CFC-free polyurethane, providing a thermal efficiency nine times that of a timber door. 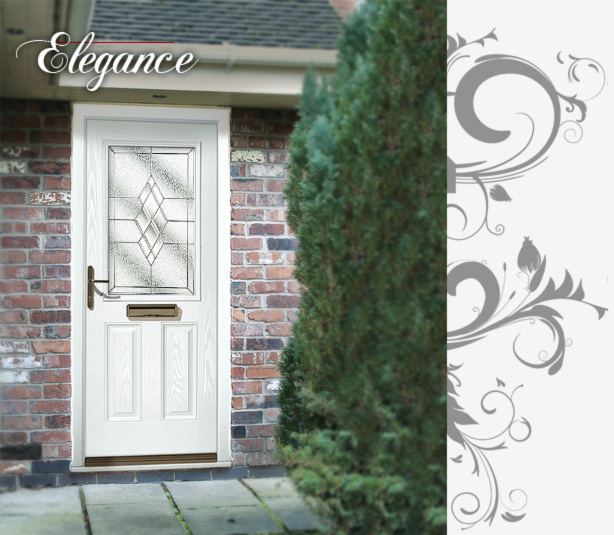 This is a door that is strong, stable, durable and secure….and looks very good indeed! The advanced glazing system, comprising a through coloured, snap together ABS cassette, matches both the skin and depression mouldings of the door. It is secure and attractive, with no unsightly plugs or screws. For customers who wish to have a single or a pair of sidelights, that truly match their GRP composite door,we offer a composite side panel solution with all the same benefits of the composite door - colour, style, security, sound and heat insulation. All our glass ranges are suitable for matching composite sidelights but owing to manufacturing specifications, size limitations do apply. Please ask about this.